Works great for water hose too! The Big Gorilla has a more substantial, rectangular base. It was designed this way so that it can be stacked and you can have two or even three reels stacked together. We sell a stack kit that allows for the stacking of the reels in this manner. The Big Gorilla holds the same amount of hose as the Little Gorilla. The Big Gorilla is shipped KD in a box that is 24” x 18” x 5” and weighs 21 pounds. Assembly of the reel and frame takes 15 minutes or less. Space required for installation: 18” high, 15” deep, 30” wide. The Double Big Gorilla is two Big Gorilla reels joined with a stack kit. 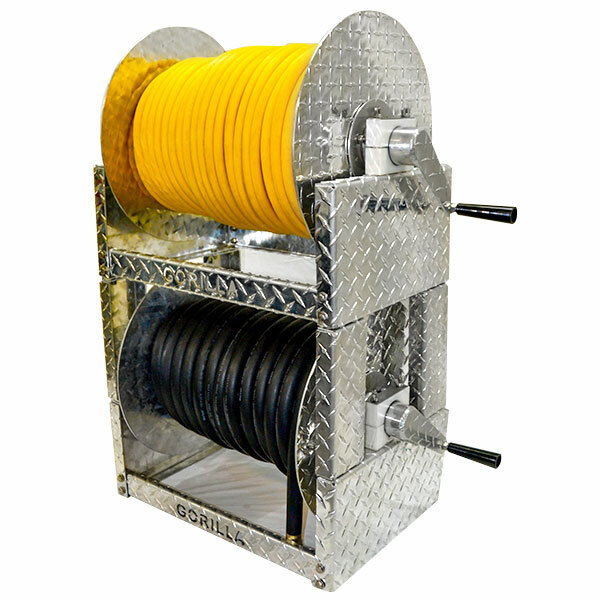 The double reel can be used for water hose, soft wash spray hose, or a combination of the two. Because of the large diameter swivel that is used, you can plumb this as a live reel for your water hose used to fill your pressure washing water tanks. The large diameter of the swivel does not impede water flow the way that the high pressure steel swivels do. The double Big Gorilla ships in two boxes that are 24” x 18” x 5” with a weight of 24 pounds per box. Space required for installation: 36” high, 15” deep, 30” wide. Finally! 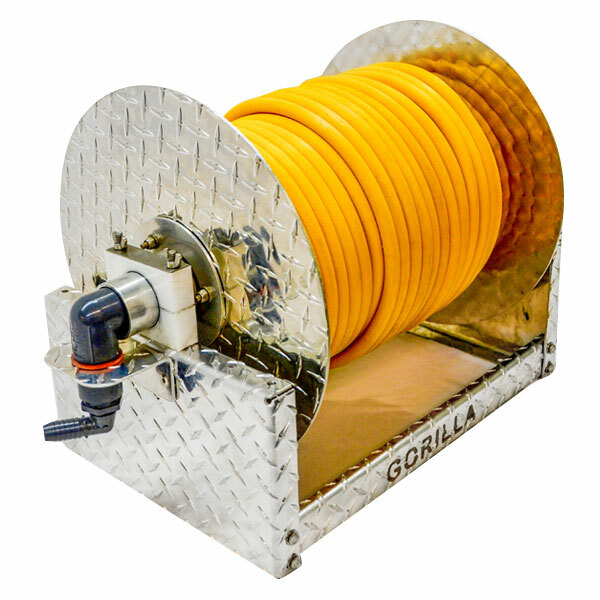 A Chemical Resistant Hose Reel made for the cleaning industry.